Fall is rolling in so wonderfully. But I still have some end of summer garden goodies to go through. 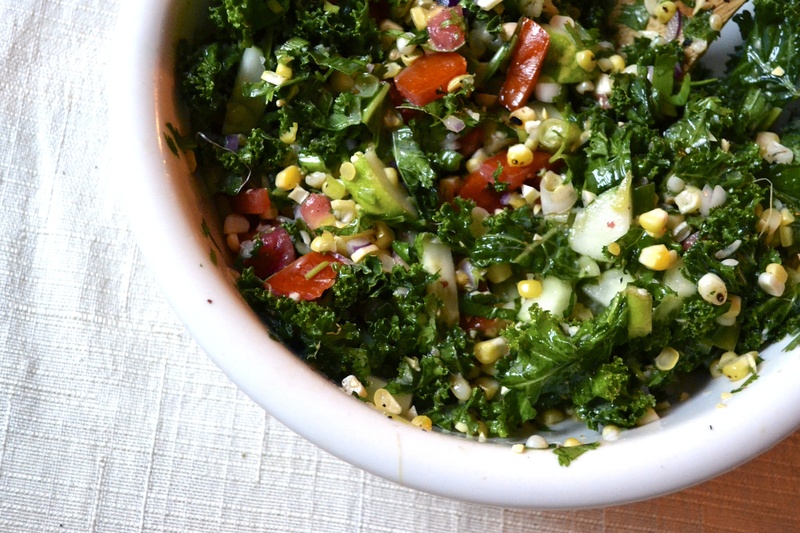 This salad is a culmination of everything that the end of summer has to offer….corn, cucumber, tomatoes, kale, cilantro! It’s all here and ready to punch your taste buds and use up any great garden overflow. This your last chance. Get it in before pumpkins take us all over! I may be a little late for some of you. Ya, I see your Pinterest pages devoted to pumpkin everything…. yes, I too am salivating. But I have to slip this one last salad in here before we all turn orange and spiced and everything nice. If you are a part of the lucky few to still have sweet corn, I have a super easy peasy way to roast it…do it on your gas burner on your stove. Have electric oven? Never fear…stick those shucked ears into the oven under a broiler. Ooooh! But keep an eye on them or else you’ll end up with popcorn in your oven. This salad is also brightened up with one of my favorite herbs, cilantro. The Cilantro Lime Vinaigrette is based on this amazing recipe from Closet Cooking. You can use this vinaigrette on anything…shrimp, delicate squash, kale, maybe even pumpkin, but also your finger…anything. So give all of those lingering veggies a home and place them in a bountiful bowlful of love. And please, resist the urge to dump pumpkin in here…for just a few more days! Wash and remove the stems from the kale. Cut into 1-inch pieces. Place into a bowl and gently massage the kale (yes, massage it), until the bright green leaves start to turn dark green. I promise, it will taste better. Sprinkle with a little bit of salt and set aside. 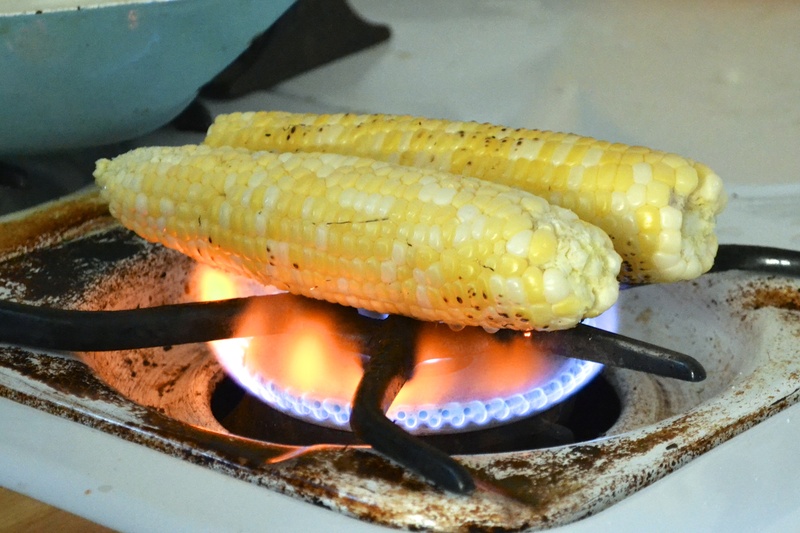 Place shucked ears of corn either directly onto a gas burner on your stove (as shown on the picture), or onto a hot grill, or under a broiler. Watch carefully, and turn every few minutes until all sides are sufficiently charred and roasted to your liking. Cut kernels from the cob. To do this, rest the ear firmly in a bowl or on a cutting board and use a sharp knife to cut from stem to tip. Make sure to not cut into the cob. 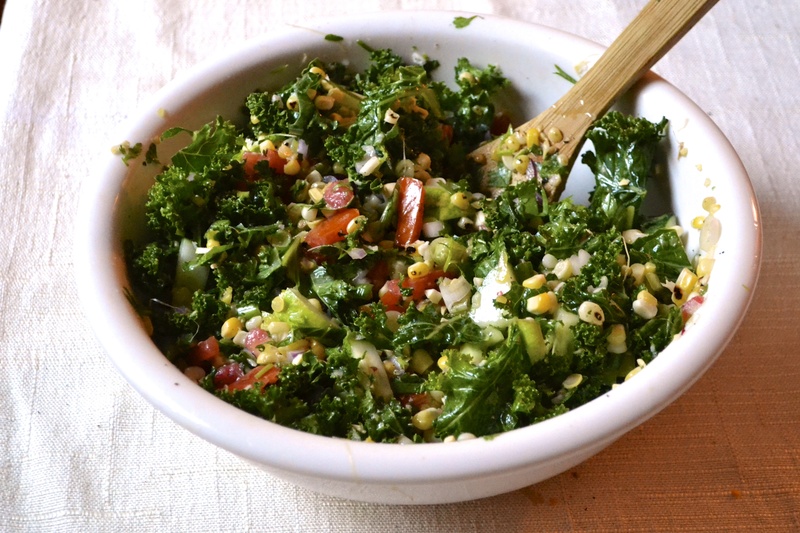 Toss the roasted corn kernels, diced tomatoes, cucumber, and onion into the bowl of kale. Place all ingredients for the dressing into a bowl of a food processor and blend well. 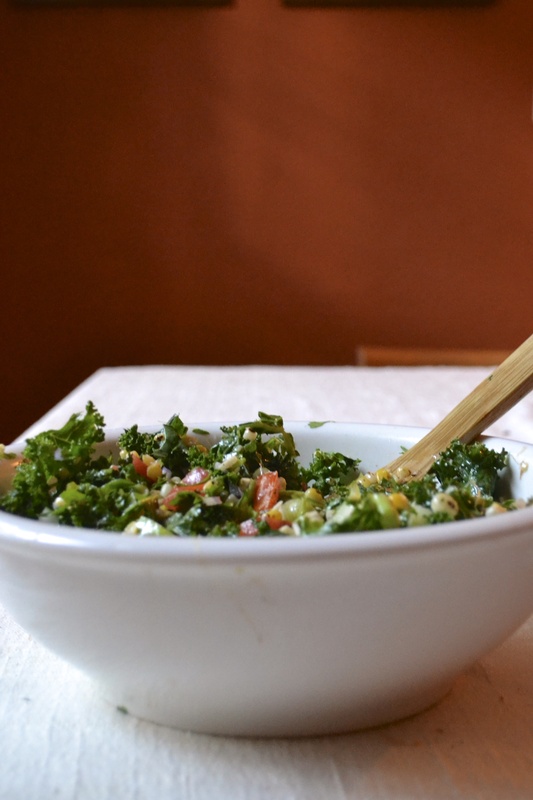 Drizzle the dressing on top of the kale salad. You will likely only need part of the dressing. Toss until all of the salad is covered. Refrigerate until ready to serve. Mix the salad again just before serving. You may need to top it off with reserved dressing. Store any leftover dressing in the refrigerator and use within 3 days. I have been LOVING corn on salads this season! Something I never really tried before. Love cilantro, love lime! The vinegrette looks delicious also. I love keeping a jar of my own dressing ready to go. I’ll give this a try!